In any other scenario, gallivanting like a couple of bumbling idiots in the posh ski town of Aspen, Colorado might be something to avoid. That is, unless you've been meaning to cross cosplaying as Harry and Lloyd from Dumb and Dumber off your bucket list, in which case you may want to hit up Denver's Curtis Hotel. The hotel is currently offering a special ski vacation package inspired by the 1994 hit comedy that comes complete with lift tickets, private jet transportation, and of course, obnoxiously colorful ruffled tuxedos and top hats. For Dumb and Dumber super fans, the Curtis Hotel has organized an over-the-top "Harry & Lloyd" weekend getaway trip for two inspired by the hapless pair's adventure in Aspen, "a place where the beer flows like wine, where beautiful women instinctively flock like the salmon of Capistrano," at least according to Lloyd. 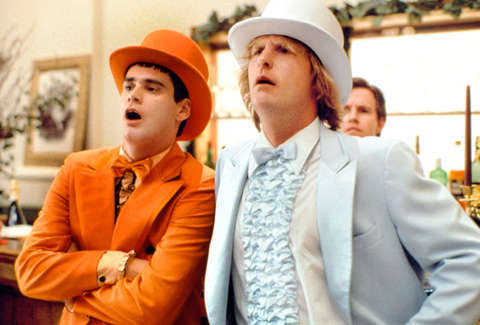 The special offer features quite a few nods to the film, starting with an included pair of ruffled tuxedos with top hats (in orange and powder blue, naturally). It also comes with a two-night stay at the Curtis, private jet transportation to and from Aspen, and two single-day lift-tickets at Aspen Mountain, where you can hit the slopes on a new pair of Icelantic skis. On top of that, you'll get a three-hour moped rental to tour the sites of Denver (up to you whether to do it in the tuxedos), $200 to spend on hotel spa services, brunch, and a 12-pack of beer from the Aspen Beer Company to enjoy on your flight home. Unfortunately, this foray into the absurd doesn't come cheap. The whole excursion is priced at $10,000, though to be fair, even though it's expensive, it's still probably better than spending your money to see Dumb and Dumber To.